Can designers keep up with the pace of change? I recently finished Thomas Friedman’s, Thank You for Being Late: An Optimist’s Guide to Thriving in the Age of Accelerations. I found it to be one of the most impactful books I’ve read over the last two years. I highly recommend reading it yourself but I’ll cover some of the highlights and how they pertain to our future as UX designers. The book is based on the premise that technology, economics, and the climate are all accelerating faster than they ever have. I used to believe this was all just the optics of our always-connected world, but he convinced me otherwise. By connecting the dots between Moore’s law and how that exponential growth in chip speed has correlated to exponential growth in potential and power of technology. As a result, we are not faced with linear evolution, but exponential growth. Collectively, humanity will have to improve how we handle this change. As designers, we will have to figure how to navigate this accelerating world while still finding ways to do good work. We are already seeing great advancements in the field but with costs. Design systems are a great example. They provide ways of optimizing and standardizing design, but can come at a cost. Trends in design tool evolution, the flattening of the design community through communities like dribbble.com, or even continuous development methodologies are all examples of movements that have amazing upside but require serious exploration and soul-searching to ensure we continue adding value to the world. In this overview, I use Friedman’s book as a backdrop to illuminate how accelerating technological advancements affect the world of design. Whether the robots take our jobs, or Airbnb makes an algorithm that can create an entire design system from scratch…or if General Assembly renders your Master’s degree worthless (that can’t happen, right? RIGHT?! ), your value as a designer will be measured in how well you design with intent. My career in UX started in 2004 with my first undergrad course in HCI and then proceeded into grad school where I learned (and re-learned) key design principles. I read every book I could find which covered how to “design properly.” While I have mostly internalized things like GOMS or Fitts’ Law, I tend to believe these are less important in the field of UX than they were 10 years ago. It’s certainly true that professional UX designers should know the basics, but the field has expanded much beyond simply following key principles. Devices, connectivity, and the overall ability for people to communicate with interfaces has opened the door for deeper engagement with design. “Good usability” was once a competitive advantage. Today it’s expected. Designers have to level up. As a result, it’s no longer enough for a design composition to be fundamentally sound, and measured by metrics like clickthrough rate or methods like eye-tracking. Today’s designs alter behavior, tie to strategic business goals, and can be iterated on in weekly dev cycles. This means that designers must take seriously what it means to be intentional in their work. It’s not enough to defend your button placement based on spatial rules. You’ll have to defend WHY the button is there to begin with. It’s not enough to design a compelling news stream. You’ll have to defend why keeping someone glued to a news stream is ideal in the first place. This leads to the next key point. Never before has technology allowed individuals to do more harm (or good) with such low effort. Mike Monteiro has beautifully called this out before. For those working at attention-hijacking factories, or those who cite Nir Eyal for why you’re push notifying users 5x a day, your days are numbered. Alerts are the new smoking and you can be certain this battle with consumers (and government regulation) has just begun. The book that shaped my ethics. Over a decade since the first edition and more relevant than ever. But there’s more to design ethics than awareness. The act of taking no stance is no longer acceptable; this was one Monteiro’s central points. From social issues like gender and sexual orientation, to more benign ethical dilemmas like, “is it ok that one of my goals is to make this B2B SaaS more addictive?” designers need to establish personal ethics. Why does this matter in the age of acceleration? To me, it seems that ethics help fortify yourself against the wave of constant technological advancement. This will keep you from becoming smitten with new technology and help you elevate your work to ensure your designs support missions that you truly believe in. 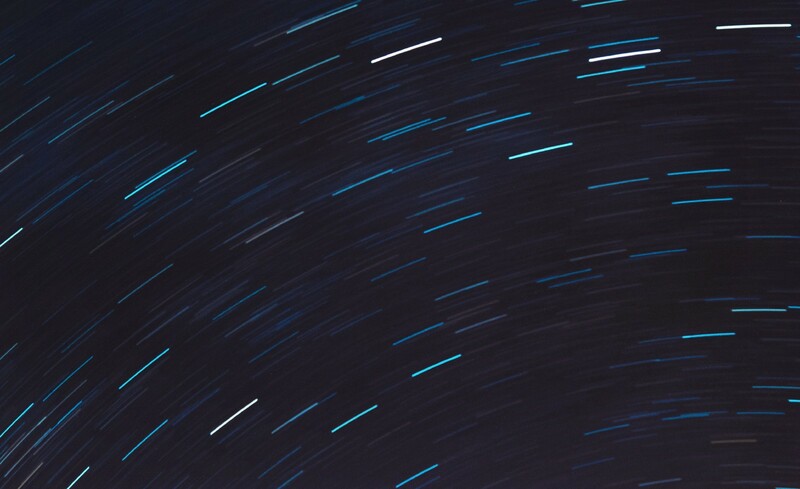 As technology’s pace accelerates, your ethics keep you grounded. Quick disclaimer: It may sound like I am one of those insufferable types who puts designers on a pedestal and believes the field carries more moral burden than other disciplines. On the contrary, I believe ethics are a shared burden, and I’ll be the first point out that designers aren’t any better than anyone else involved in bringing digital products to market. I merely point these issues out so that designers begin to see the expanding scope of what it means to design in an accelerating world. Intent and ethics are the new principles. And they must be constantly revisited and honed through ongoing learning and humility. The point is simply that designers must have ethics, they can’t simply sit on the sidelines. As much as my introverted tendencies shudder to think, the way designers work will continue to involve more collaboration. And more collaboration means that interpersonal skills will become equally, or more important. The curtain has been lifted on many parts of the design process and great designers are no longer expected to go “work their magic” alone for days and reveal their brilliant solutions in a masterful keynote presentation. Yes, designers will need time to themselves, but other stakeholders will be along for the process more than ever before. Technology has allowed products to get designed, marketed and sold faster than ever. To account for this, teams are more cross-functional than ever. When I started my career in 2007, I couldn’t name a person in product marketing or sales. I interacted with our product’s PM, 2–3x a year. Today, PM’s and designers collaborate. Sales may ask design for help in a demo. Marketing may influence product requirements. To accelerate, product teams must assimilate to innovate (eye roll). The new rock-star designer won’t be someone designing amazing things but one who facilitates work, enables teams to do better work, and frankly, works well with others. Remember responsive web design? It’s still around but it’s commoditized and almost table stakes for most design work. But there were people writing freaking books about this 5 years ago. To be a great designer, you can’t waste that kind of time. While you’re becoming an expert in conversational UI, AR just virtually ate your lunch (in fact, with accelerating technology, it’s best to let tools and frameworks do the heavy lifting. RWD is beautifully handled in tools and dev frameworks today and it’s not nearly as burdensome as we feared three years ago). 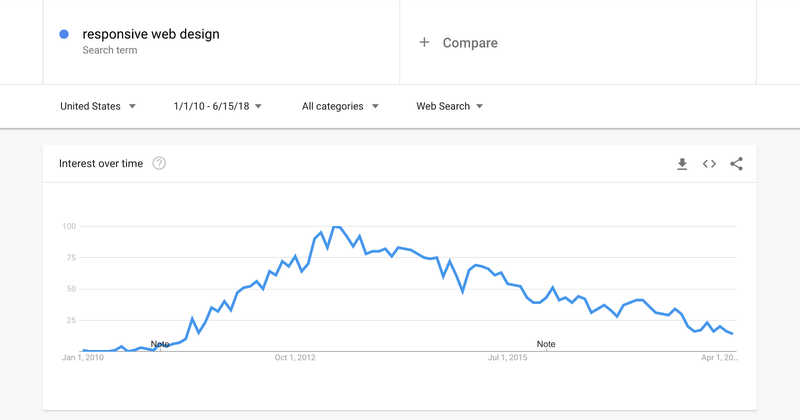 Search trend for “responsive web design” between 2010 and 2018. Really, really good writing is evergreen. I’ve re-read some of my favorite design thinkers several times (see Stolterman above) and continue to learn more because I make different connections based on what I’m currently working on. When you focus your learning on foundational, well-researched content, then you get more out of it. This helps you know how to stay grounded when constant information and trends fly by you. And hey, as long as you eat healthy day-to-day, you can afford to eat fast food now and again. My goal in this article was to make a connection between this technological acceleration and how it will affect design. There are dozens of specific areas that deserve much more exploration. My hope is that it inspires designers to think about how this affects your work. How you will be valued over the next five years will be vastly different from the last five. So start planning ahead. When I’m not upholding Moore’s Law, I’m leading the design team at Innovatemap and working on Sketch design tools at UX Power Tools to make you a better, more efficient designer. By day, executive designer at Innovatemap where I help tech companies design marketable products. By night, co-founder of UX Power Tools. A publication for designers, written by designers.